Last week was one of those weeks where solutions to problems just seemed to come. You see, I've been bothered by the fact that I was limited on the time I could spend hand embroidering. For some reason, when it comes to hand embroidering, I find using a normal thimble cumbersome. So, the finger I use to push the needle would develop a small surface hole that's quite tender and the middle finger underneath my work would get scraped by the point of the needle, thus becoming sore. You would think after years of hand embroidering I would get callouses rendering this a none issue, but that is not the case. It was time for a solution! 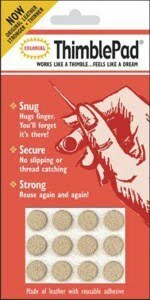 It dawned on me that we had these little Thimble Pads at the Fibre Junction. So, I gave them a try! They work beautifully! They are not cumbersome and thus allow me to push my embroidery needle through. They last too! The adhesive works for a long period of time. I've been using one for the past 4 (four) days and it still sticks to my finger. As for the colour, well it sort of has picked up the colour of my thread - black! Of course this didn't help the left hand issue, the one that's underneath my work. Sure I can alternate between fingers, but after a while they all get sore. Ding, a light bulb came on! Why don't I try the Under Thimble by the same company? Picked that up at the Shoppe too! 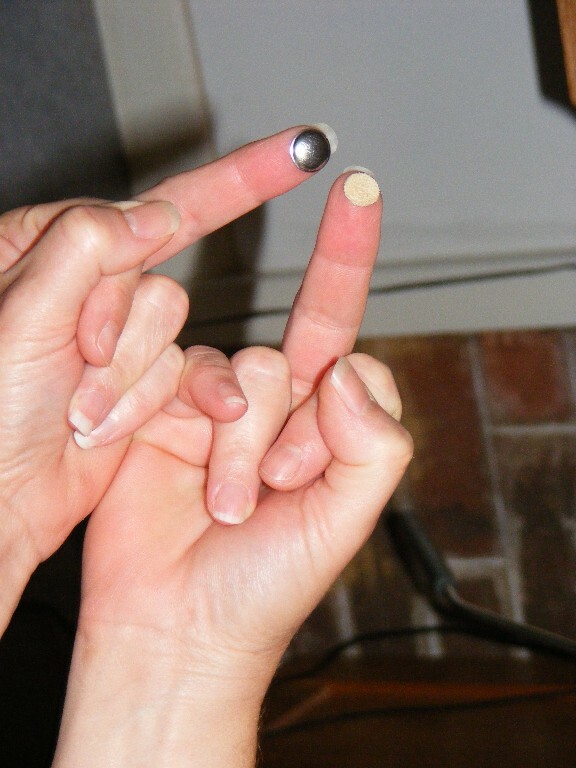 Well, stuck one of these metal spheres on the other middle finger and gave it a try. Took me a few minutes to get used too, but it's working great. The needle scrapes the surface of the metal as opposed to my finger. With these little thimbles on, I can stitch for days on end! Of course I feel kind of funny myself when I show off my middle fingers with the thimbles on! LOL! Kids?!?! I haven't tried the Under Thimble with hand applique yet, but I sure will give it a try. I'm hoping I can extend the time I spend hand appliqueing! When you're on a roll, it's nice to be able to keep the pace! Tell me, do you get sore fingers when you work on your hand embroidery? Do you use a thimble? I'd love for you to share your method/tools! I have always been one of those people who if I put a thimble on my finger will use another finger. lol. I haven't tried either of those products, but am thinking I should give them a go. I have been working on a big hand embroidery project and could probably benefit from them. I can imagine the giggles with that photo. I know what my kids would do. Oh the under thimble is new to me. I"ve used the other one but put it on my underside finger before too. sometimes I just put a piece of masking tape on my under finger. Oh good job! I use the first thimbles ALL the time - I don't use a hoop for anything, so I don't need an under thimble. I adore these adhesive dots, they work so well! I use the Ultra Thimble which is a stainless steel version of the Thimble Pad, made by the same company. I use it for hand quilting and embroidering, it's brilliant. Those look really cool. I always use a thimble on the middle finger (great picture btw) of my right hand and nothing on my left hand. I never have any trouble with applique or embroidery, but quilting is another story. I end up using my fingernails and chipping them down to nubs. I really should see if I could get used to that little metal thingy on my left hand to solve the problem! I need to keep my eyes open for these...I have a nice little callous on my stitching finger! Friendship and stitchn' away ....!